World map of regulations for amateur boat builders. I am building a clickable map, with readers help, of rules and regulations concerning boating in general where you will find the regulations for your country or state/province. Many countries require a boating license. I have data for Australia, France, Finland, Japan and most of the USA in place already. Please send your links. This is a personal selection of links, a sort of "Editors choice". There are hundreds of lists of links out there. I hope that mine are more focused on amateur boat building than most. I'm a human being so there will be a non amateur building section which may give you a peek at who I am. My all time favourite is the CLC Annapolis Wherry. I like lapstrake hulls and this one is particularly well drawn. A more reasonable choice would be the Chester Yawl by the same company but often the heart is stronger than reason! Second is an all out exercise boat - no passengers - the Wayland Verry Merry. A couple of places to go for rowing equipment are Piantedosi Oars for very neat drop in rowing rigs. The Scout Rig is on my short list of things to buy as soon as I can to drop into my own rowing canoe. And of course Shaw & Tenney just to window shop and dream. But not only to dream, the oar length calculation formula is a must have when you are making or buying a pair of oars. Sailing: I started sailing in the late 1970s upon arrival in France. My first boat here was a 15' beach cat - multi hulls are my idea of sailing - even though I have done a lot of day sailing and cruising on small mono hulls up to 30'. My favourite plans for the home builder are the Farrier folding trimarans. You can read much more about building one in these pages. 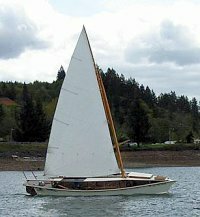 If I were to build a cruising mono hull the Parker Swansea Pilot Schooner would be on the short list. So would the Bateau Vagabond 18, ideal for short cruises on the Atlantic coast and weekends on the islands. Motor boats: I would like to build a Bateau Trawler 28. I have modified the cabin for Mediterranean cruising. The Squirt would be a great boat for Sundays on the river. Or maybe one of these redrawn for stitch and glue? This list is classed by alphabetical order, I have favourite boats not favourite web sites (other than a.b.b. of course!). These are some other sites that I visit regularly and that are not linked above or elsewhere in a.b.b. Benford Design Group - would I live on a "Friday Harbour Ferry"? You bet I would! Browsing around I found this gem - Proafile. Heaps of inspiration and quality information on multihulls - proas in particular. If you must read another magazine on line the free Classic Yacht Magazine is a great ressource. Great reference book on composites, thanks Jacques Mertens for pointing this one out on the forum. Do you need a Canadian boat license?